Casper is one of the most noteworthy and beloved Mattress companies in the “mattress-in-a-box” space. Traditionally known for high quality mattresses available at a moderate price point online and a 100 day trial period, Casper mattresses and sleep products are now available in 15 concept stores as well as select Target stores around the country. Today Casper offers three models of mattresses that are known for motion isolation, breathability, hassle-free delivery, and a 10-year warranty. As of 2018, Casper offers three mattresses including a revamped version of their original mattress. These mattresses range from five to ten inches of comfort-enhancing foam allowing for some customizability in their product line. The two thicker mattresses on offer by Casper — The Casper and the Wave — both also offer the patent-pending Hyper-Targeted Support system. Hyper-Targeted Support offers a unique feel to which many Casper customers are hooked. Mattresses utilizing Hyper-Targeted Support provide for just enough “hug” in just the right places while still offering firmer support elsewhere. Casper’s support system achieves this through providing differing levels of firmness and support in 36 different zones. Besides the quality of Casper mattresses, many consumers have fallen in love with their price point and business model. If you’ve never experienced a “mattress-in-a-box” company, you may be in for some (good) surprises. Casper offers free shipping and set up of their mattresses, a 100-night risk-free trial, free returns, and a 10-year warranty on their product. While this is in line with other “mattress-in-a-box” companies, Casper differentiates itself through a longer warranty and free set up, neither of which are available in all competing brands. While most “mattress-in-a-box” companies make getting your mattress easier than ever, Casper excels in this regard as well. Mattresses are shipped by UPS and generally arrives within 2-5 days of purchase. Unlike other mattress makers who ship their mattresses in a several hundred pound “log” shape, Casper mattresses show up in an easier to handle box with a special tool to cut through the wrapping. Once you’ve unwrapped your mattress and situated it in a more permanent location, the mattress expands to its proper shape. In the event that you require a return, Casper is known for providing one of the quickest “pick up” services. While you will need to provide a reason why you would like to return the mattress, Casper is known for picking up your mattress for return within days, not weeks. The same can’t be said about some competitors in the space. An additional perk is Casper’s unique price point. Depending on the mattress you’re looking at, queen-sized Casper mattresses range from $600-$1,995. While that may seem like a wide range, traditional mattress makers touting many of the same high-quality materials often sell their mattresses for 3-4 times the price. With their highest end queen-sized mattress coming in at less than $2,000, Casper occupies a price point lower than traditional “high-end” mattresses. Touting innovative materials and “mattress-in-a-box” perks for a below average price? Yes, please! Even if online mattress companies do make buying a mattress pretty risk free, we realize that mattresses are a large purchase and can be daunting. Hopefully, you’ll be spending years of your life — and some of your most quality restorative time — on your mattress. That’s important, and why we check out all sorts of mattresses here at Online Mattress Reviews. 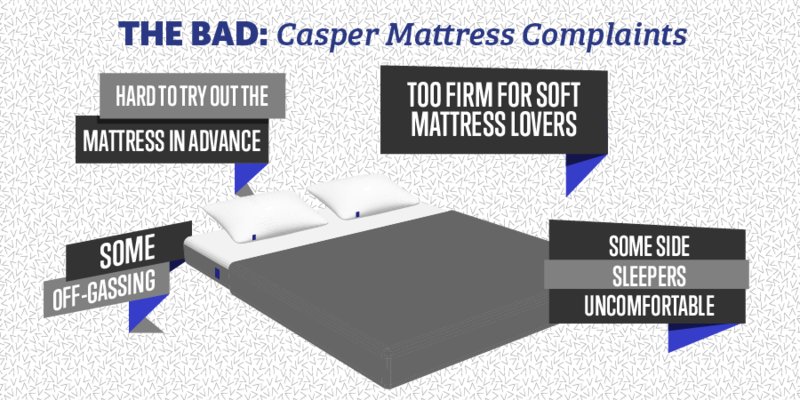 To help in this process, we present our guide to Honest Casper Mattress & Bed Reviews: The Good, The Bad and the Ugly. According to the Casper website, over 1.2 million customers have slept on Casper beds for at least some time. Of those customers, around 12,000 have left reviews on Amazon or Casper’s own site (with over 30,000 Google Verified Purchaser Reviews). With an average review of 4.4 out of 5 stars, reviews have been overwhelmingly positive for Casper mattresses. Below we’ve listed some of the most common selling points listed in reviews rating Casper at least 4/5 stars. Simple, user friendly delivery, unboxing, and setup. Available in-store to try out in many larger markets. Many reviewers note good interactions with customer service. Can easily be set up by one person. Casper will take away your old mattress in larger markets. Casper mattresses come with a 10-year warranty. Long-lasting firmness (very little sagging over time) where needed. Noteworthy quality from reviewers transitioning from cheaper and more expensive mattresses. Both customers moving up and down in their price point citing how much of a “value” Casper mattresses are. Many reviewers are repeat customers. Many mattress customers follow up with purchases of other Casper products. Many pleased converts from mattresses 3-4x the price of Casper. All foam layers are CertiPur-US certified non-toxic. Many reviewers noted Casper’s ability to feel both “soft” and “firm” in the right spots. Zoned support layers particularly good for back and stomach sleepers. Many reviewers report very little “adjustment” period with better sleep on the first night. Lauded by stomach, back, and side sleepers. Easily adjusts to account for additional weight of pets on the bed. Many happy reviewers with back and joint issues. Varying support levels throughout the body that fit most sleepers. While Casper mattress reviews are largely positive, no one mattress is a perfect fit for all sleepers. With close to 12,000 total customer reviews, there are plenty of customers for whom Casper mattresses are just not the right fit. Below we’ve outlined some of the most common mild to moderate complaints about Casper products. For context, these complaints are not necessarily “deal breakers” for customers, but are noteworthy enough for them to lodge complaints against the buying process, product, or sleeping experience. As of the writing of this article Casper had 640 2-star reviews, 1080 3-star reviews. Together 2-3 star reviews comprised 14% of all Casper mattress reviews on their site. Though Casper sells itself on being soft and firm, lovers of soft mattresses claim Casper is too firm for comfort. Some customers experienced “off-gassing” of fumes for several weeks after set up. A sizable portion of lower reviewers needed to add pillow-tops to their mattress. Some models 2-3 inches shorter than spring mattresses leading to aesthetic issues. A small but notable portion of reviewers noted they slept “hot” due to lack of breathability. Some side sleepers report pressure points due to firmness at the shoulder and hips. Softer Casper mattresses can cost significantly more. Some reviewers reported increased sinking from the foundation. Some reviewers note low quality mattress cover that only covers the top half of the mattress. Notable portion of low reviewers note the mattress is of “average” quality. Customers wanting their mattress to “break in” or “soften up” may be disappointed. Some reviewers who had tried Casper mattresses of others cite large variance in firmness levels between the same model of mattress. Some reviewers report California King mattresses are smaller than standard box springs and other mattresses. For a small group of Casper customers, buying a Casper product was a bad decision. As of the time of this writing, close to 1,000 out of 12,000 reviews (8%) left reviews of 1-2 out of 5 stars. While 8% is still a noteworthy number of very unsatisfied customers, it is notable that the number of very unsatisfied Casper reviewers is significantly lower than for competing mattress companies. Below we’ve listed some of the ugliest reviews for Casper Mattress products. A small percentage of customers noted unbearable out-gassing that lasted for several weeks. Some reviewers seeking softer mattresses found Casper mattresses very uncomfortable. Many customers who have never used memory foam found it hard to adjust to Casper mattresses. A small but notable group of reviewers note that their mattress originally worked well but sags — leading to great discomfort — within the first three years. Reviewers seeking to return a bed they purchased with financing are asked to pay interest on their financing before returning their bed. The original Casper mattress, known as — surprise — the Casper has been around for several years with a starting price of $590 for smaller mattresses. Since the original release of the Casper, Casper has updated their Casper mattress as well as released two other mattresses: their most affordable mattress, the essential, and their higher end The Wave. The range of prices for these mattresses encompasses $350 for the smallest model of the Essential all the way to $2,395 for the California King and King sizes of the Wave. With that said, most Casper mattresses are firmly in the middle of this range. Perhaps the largest differences between these three models are their relative thickness, with the Wave being the thickest mattress, the Casper in the middle, and the Essential on the thin side. This corresponds with additional “Zoned Support” in the Casper and even more expansive “Hyper-Targeted Support” in the Wave. 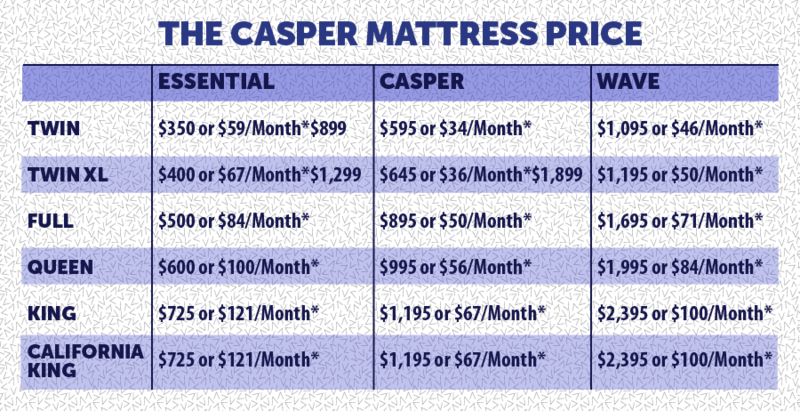 As of the time of writing of this article, the complete lineup of Casper mattress prices may be found below. Besides mattresses, Casper also offers an entire line of sleep-related gear. Many of their products seek to complement the strengths of their mattresses maintaining breathability, support where it is needed, softness where it is needed, and durable design. Below are the current prices for Casper products that are not mattresses. *Financing for Casper Products is available through Affirm at checkout. Customers seeking financing may apply for a financing decision in real time. Those who qualify may select between 6, 12, and 18 month payment plans. APR ranges from 0-30% depending on the applicant’s credit score. For items less than $100, there are limited financing options. Down payments may be required. The estimated monthly prices listed with products above assume a 12-month repayment period with 10% APR. Checking to see if you can qualify for financing through Affirm does not affect your credit score. For a Casper mattress to truly be valuable to you, you’ll need to ascertain whether or not you find the product comfortable and suitable for your sleeping habits for an extended amount of time. Though Casper offers a 100-day trial period, you will need to pay for the mattress up front and abide by Casper’s return policy stipulations if you don’t like the mattress. Add to this the fact that an unsuitable mattress can steal weeks of quality sleep from your life while you’re “getting used to it” and there is undoubtedly some risk in purchasing a mattress online. This risk in the “trial period” is present for any new mattress, however. And if you already know that you would like a mattress of medium or medium-high firmness and that is memory foam, then you can rest assured that Casper will at least be in the ballpark of what you’re looking for. With all of that said, a large majority of Casper reviewers love their Casper mattress. So, assuming you have done your homework and you would like the feel of a new Casper mattress, is it a good value? To start, let’s look at the mattress Casper is most known for, their original Casper mattress. The Casper mattress is currently in its second iteration, and occupies the “middle of the road” as far as prices for Casper mattresses. The Casper mattress supplies many of the innovations that Casper as a brand are known for. Most notable, the Casper mattress offers durability, breathability, quality motion transfer, 4-layers of foam for pressure relief, and “zoned support.” This last feature is potentially what the mattress is most known for and offers softer foam around the shoulders and firmer foam around the hips and core. This Zoned Support technology allows sleepers to feel as if there is “just enough support in the right places” or that the mattress is “both soft and firm”. An additional aspect of the value proposition of a Casper is in the “mattress-in-a-box” experience. Casper offers a 100-day trial period, free delivery and returns, and a 10-year warranty. Many customers have also cited particularly helpful customer service representatives and the easy to “set up” nature of their mattress. 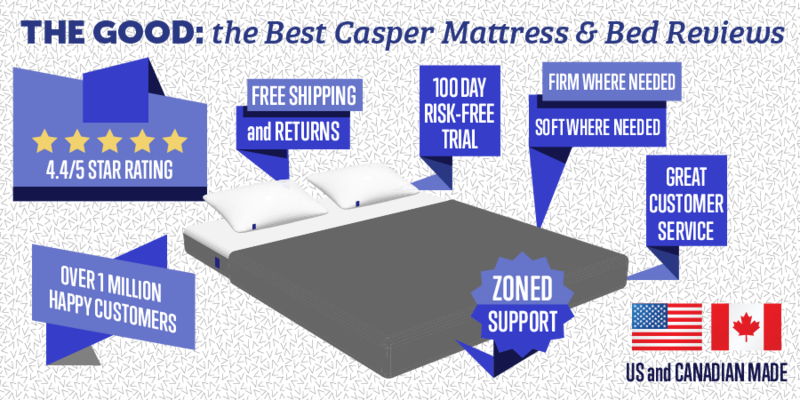 If you are primarily looking for a modern, mid-firmness level mattress, with quality support and delivery, then the Casper mattress may be the choice for you. Starting at $595 for a twin and ranging to $1,195 for a King or California King, Casper occupies a price point right below a “typical” mid-tier mattress. If you’re in love with the quality of Casper materials and their unique delivery method, you can take heart that high-end queen-sized mattresses typically start at around $1,800, close to $1,000 more expensive than a Casper. At the King size, Casper mattresses are an even better deal. King-sized Sealy mattresses typically range close to $1,000 more expensive than King-Sized Casper mattresses, while Serta Perfect Sleepers typically cost $500 more. One final comparison worth making is to other “mattress-in-a-box” providers. At $999 and $995 for Purple and Leesa queen-sized mattresses, Casper comes in at almost exactly the same price point. At this point the “feel” of the mattress and the quality of the user experience should dictate which mattress is a better value for you. But at a price point almost identical to its two closest competitors, you can rest assured that you aren’t being cheated out of money for comparable mattresses. The Casper Essential Mattress occupies the lowest price point of Casper mattresses. Coming in at $350-$725 for twin through king sizes, the Essential mattress occupies value mattress territory while providing some of Casper’s innovation. 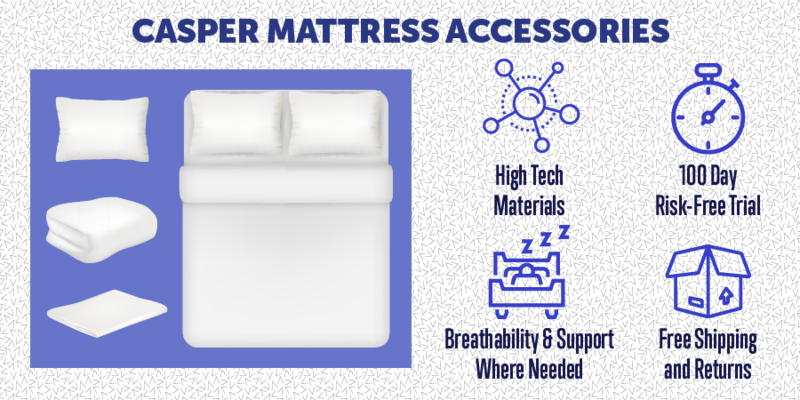 The Essential mattress is known for the same breathable construction and durability of other Casper mattresses, yet with one less layer of foam. This leads to none of the “zoned support” available in the Wave or Casper mattresses. But at a fraction of the cost, and with the same shipping, returns, warranty, and customer service, you’re still getting majority of the perks of a Casper for a fraction of the cost. Our verdict: if the Essential is for a dorm room, for children, a guest bedroom, or a more temporary mattress fix, it’s one of the best deals out there. There’s not even really a comparison from other “mattress-in-a-box” providers. The smallest size of Purple’s most affordable mattress starts at $699, while the smallest size of the most affordable mattress at Leesa costs $525. Starting at $350, Casper’s budget mattress is half the price of competitors. The Wave mattress by Casper is the highest-end model offered by the brand. Starting at $1095 for a queen and rising to $2,395 for a King, the Wave solidly jumps into the lower end of high-end mattress prices. That is, just barely, with high-end queen sized mattresses starting at around $1,800 and rising by thousands of dollars. With the jump in price for the Wave, one needs to assess exactly what else one gets compared to other Casper mattresses. First off, the Wave is constructed of 5 layers of foam, is known for its durability and breathability like more affordable models, and offers the same quality customer experience as other mattress models. Where it differs is through its innovative “Hyper-Targeted Support” system, in which 27 different support zones provide different levels of support to different body parts. Additional alignment technology helps to provide additional support or “give” in a way that complements the human spine. When looking at other mattresses with similar numbers of foam layers, it’s safe to say that more diversity of foam types often leads to a mattress that can be both soft and firm. For customers looking for a slightly softer mattress, the Wave could be the only model to truly offer comfort in the Casper lineup. At which point one must assess if the price is too much. Compared to high-end traditional mattress makers, the Wave mattress is still a deal. High-end Tempur-Pedic mattresses ring up to over $1,000 more than comparable Wave mattresses. High-end Sealy mattresses come in at around the same price as the Wave. While high-end Purple 4 mattresses come in at over $3,000. While the competition at this price point is certainly more stiff and you’ll want to make sure you’re sold on Casper’s unique style of comfort, the Casper Wave still compares favorably for the experience and level of innovation packed into the mattress. While Casper’s three models have some variety, the Essential mattress stands out the most both for having less features than the Casper and the Wave, and occupying a much lower price point. As the Casper mattress is the most popular, and is similar to the slightly higher-end Wave mattress, we will look at these two models when comparing Casper to other mattress producers. First and foremost, the most unique element of Casper mattresses are their hyper-targeted and zoned support systems. This is achieved in the Casper and Wave mattresses through different “zones” of the mattress holding different firmness levels of foam. In the Casper mattress areas of the mattress occupied by the core and back are made more firm, while areas around the shoulders and knees and given more “give” or “hugginess.” In the Wave mattress, 27 unique zones are provided with different levels of support, allowing many customers to “sink in” where they would like to “sink in” and be supported where they feel they need support. This has led many customers to explain that the Casper and Wave mattresses are both “firm and soft.” For a slightly more objective measure of firmness, most reviewers of Casper mattresses place the Casper at 7-7.5/10 on the firmness scale or slightly above the industry standard 6.5 firmness for a medium mattress. The Wave, however, is substantially softer, coming in at 3/10 on the firmness scale according to Consumer Reports. Additional features of the Casper and Wave mattresses rival those of both competing and very high-end mattress ranges. These include lauded breathability to keep sleepers cool at night, durability, and Certi-Pur Certified foam layers throughout. Certi-Pur Certified foam has been found to be non-toxic, a major plus for many shoppers. Casper mattresses have also score highly on motion transfer and edge support tests by a wide variety of other reviewers. Motion transfer helps in the event you have a partner or pet in the bed with you. Movement caused by other parties in the bed will not transfer as much to your section of the bed. Edge support refers to the ability of the mattress to support sleepers on the edges of the bed and provides uniformity in support across the mattress. This is particularly important for those who move around in their sleep or share their sleeping space with another. No discussion of what makes Casper unique would be complete without talking about their delivery model and customer service. Reviewers note with overwhelming affirmation that Casper beds are delivered and picked up in a timely manner, are easy to install, and are relatively easy to replace if they are defective. While some selling points are shared by “mattress-in-a-box” competitors, they are unique in the mattress industry as a whole and include a risk-free 100 night trial period, a 10 year warranty, free returns, possible installation, and possible pick-up of your old mattress. Free delivery and pickup for most locations. Mattress Set-up in some markets. In-person stores across some of the United States. Zoned and Hyper-Targeted Support that provides a “firm and soft” feel simultaneously. Competitive price point for the Wave. High-value price point for the Essential and the Casper. Certi-Pur Certified non-toxic foam used throughout the mattress. Slightly firmer than medium firmness according to most reviewers. Good Motion Transfer and Edge Support. High breathability to avoid overheating at night. Durability and a 10 year warranty. Casper Sleep (primarily known just as Casper) is an e-commerce and sleep product manufacturer that was originally started in 2014. Along with competitors such as Purple, Casper has captured the heart and imaginations of over a million customers through savvy advertising, advancements in mattress technology, and a laser sharp focus on user experience and customer service. After jumping on the “mattress-in-a-box” train early and gaining notoriety as a quality mattress maker at an affordable price, Casper began trying to expand their audience. A “nap tour” starting in 2015 brought first one, then two “Napmobiles” filled with four “nap pods” each around the nation. These napmobiles allowed 10,000’s of potential Casper customers to try out their products and created hundreds of hours of content surrounding the experience of the Casper team as well as the sleeping experience of visitors. Soon after the Nap Tour gained some notoriety for the brand, Casper — still on their first iteration of the Casper mattress — began partnering with retail stores. Partnering with higher end modern furniture store West Elm for most of 2016, in 2017 Casper expanded their presence into Target stores with their pillows, bedding, and a collaborative lounger. Casper mattresses are also available on the Target website. In the Fall of 2017, utilizing the experience of 100,000’s of Casper first generation customers, Casper released their higher-end Wave mattress, their budget the Essential mattress, and a second version of the beloved Casper mattress. While Casper 1 and 2 look identical to one another, Casper made close to 50 changes between the models. At the rollout of the second generation Casper mattresses, Casper also created 15 pop up stores across the nation where customers may try out their bedding before ordering. Pop Up stores were initially slated to remain open through the spring of 2018. Since then, Casper has built on their “nap pod”-related marketing success by opening up nap-pod locations in Indigo Books and Music stores in Canada as well as a permanent store in New York City. Today there are 18 in-store locations where Casper mattresses may be tried. Aside from a guerilla marketing and a physical presence, Casper has managed to differentiate their brand through notable better customer service than many of their competitors. This is noted time and time-again in thousands of Casper reviews. Furthermore, customer service and logistics are effective. Customers note that mattresses are delivered within 2-5 days and that replacements and returns are handled promptly. Casper has spent noticeable time on their delivery protocols, with mattresses fitting into a sharp looking and easy to handle 17 x 17 x 42 inch box, often with a hand-written note to each new customer. Coupled with down-to-earth marketing and advancements to mattress technology, Casper is clearly differentiated in the mattress and mattress-in-a-box space. We can’t wait to see what the Casper brand has in store for us next! Casper Sleep (usually known as Casper) was founded in 2014 as an ecommerce company entering the “mattress-in-a-box” space. Initially funded by $1.85 million in an initial funding round, the company relied on a number of founders with mattress and e-commerce experience. From the start, Casper’s mission was to make purchasing a mattress as painless as possible. Upon their launch, selling the original Casper mattress, Casper sold over $1 million in product within the first month. This initial success inspired an additional $13.1 million in Series A Funding from a variety of venture capital firms. Later in 2015, Casper launched expanded delivery routes across contiguous Canada, greatly expanding their market. The next year was massive for Casper funding, with a series B funding round of $55 million coming in in June of 2015. This funding round included a number of strategic celebrity investors including Toby Maguire, Leonardo DiCaprio, Scooter Braun, and Adam Levine. With increased capital Casper was able to expand their product line to include pillows and sheets, a crucial development for future placement in retail stores. Casper’s largest funding round came in 2017 when Casper both released two new mattress (the Wave and the Essential) as well as began selling bedding in Target stores nationwide. The funding round was led by the Target Corporation and valued at $170 million in series C funding. In 2018, Casper has continued to expand with their three mattress lineup and a new collaboration with United Airlines. The Casper and United Airlines collaboration entails new bedding products throughout United Airlines flights offered by Casper. Additional recent developments include a manufacturing plant being created in Canada (Casper had previously constructed all mattresses in the United States) as well as the opening of four stores in Canadian provinces over the next twelve months. As with many mattress-in-a-box style mattress makers, Casper does not offer quite as full of a lineup as traditional mattress makers. With that said, Casper has a wider range than many competitors including a budget mattress, their flagship mattress, a higher-end mattress, related bedding accessories, a range of bases, and even a dog bed. You can find a brief rundown of all Casper products below. Casper pillows build on many of the same ideas that are in Casper and Wave mattresses. They’re built to be supportive on the inside with a touch of fluff on the outer layers. Close to a billion fiber coatings create an inner pillow with a liquid-like but supportive feel. This makes for a solid pillow that’s resistant to clumping. Not being foam, the pillows are also known for being breathable. Known for well distributed filling to promote spine and neck alignment. Known for the same “soft and firm” feeling many express about Casper mattresses. In one of Casper’s largest funding rounds Casper partnered with Target to provide bedding products in-store nationwide. Through a great deal of research Casper came to offer a unique sheet that doesn’t focus on thread count, but rather on the quality of cotton and weave. Made with premium extra-long staple Supima cotton, these sheets are known for not wearing thin over time but rather getting softer with every wash. A lightweight percale weave mixed with a 400 thread count promote breathability as well as softness. Perhaps best of all, you can head to a Target near you to try them out. Known for durability, softness, and breathability. Thoughtful details such as robust elastic, snaps in the corner of duvet covers, and visual guides for making the bed help these sheets stand out. 100-day risk-free trial if bought online. Fit any mattress of a standard size up to 14 inches deep. The Casper Duvet is meant to be a lightweight year-around down-based duvet. Constructed using cues from performance outerwear, the duvet is sewn into small rectangular chambers of down, holding down in the proper place and providing warm air pockets throughout. Modeled after performance outerwear with small rectangular down pockets. Down stays evenly spread throughout duvet. Humanely sourced duck down is one of the best temperature regulators. Useable year around in most climates. While Casper offers a very generous return policy, many new customers will want to make sure no stains reach their mattress in the event they would like a return. Additionally, mattress protectors are great options for enhancing the longevity of your mattress. As with many of their products, it should come as no surprise that Casper has rethought the mattress protector, providing a waterproof, breathable, and silent mattress protector that fits all of their mattresses. Waterproof, based on premium outdoor gear. 360 degree grip fitting any mattress up to 16″ thickness. The Casper Adjustable Base is the most comprehensive base setup offered by the company. Elevate your head, feet, or both with the click of a button. Additionally the base may be adjusted to three separate height preferences, enabling your bed to better fit with the furniture in your room. The base is flexible foam friendly, meaning it works to support any Casper mattress or mattresses made of similar materials. For customers who own a split king-sized mattress, both sides of the bed can obtain different incline settings. Incline your head, feet, or both at the touch of a button. The Casper Foundation is meant to provide durable support for any Casper mattress and may be set up in a matter of minutes. A more affordable alternative to the adjustable base, the Foundation is solid wood with evenly spaced slats and does not require any tools for assembly or disassembly. Easy to put together and take apart. The Casper metal frame is placed below a foundation or box spring to elevate your mattress higher off the floor. Particularly affordable and easy to assemble, the Casper Metal Frame is made of 100% recycled steel and fits all Casper mattresses with foundations. Made with 100% recycled steel. Casper’s dog mattress went through 110 prototype iterations to become one of the fanciest dog mattresses on the market. 460 hours of lab testing and 11 months of dog sleep studies back up the design which features some amazing dog-centric innovations. The bed itself is based on the same supportive foam technology included in human mattresses. Surface features meant to mimic excess material on top allow digging dogs to mimic the sensation of pawing loose earth to prepare a nest. Extra strong cover material protects from dog chewing. Additionally the cover is removable, easy to clean, and zippers are hidden. Based on a large range of research. Surface features excess material meant to mimic the sensation of pawing loose earth (for dogs that dig before lying down). Supportive foam bolsters the mattress creating the feeling of an enclosed, safe space. Durable cover to stand up to chewing. There are a variety of ways to get a discount on Casper mattresses, as well as a number of ongoing deals through the brand. Delivery is free in the contiguous US and Canada as are returns. Sleepopolis offers a $50 promo code discount on Casper mattresses. Offers.com provides a variety of discounts and offers for Casper. Casper Mattresses are primarily purchasable online through the Casper site, the Target website, and Amazon.com. Note that when buying online through any site other than Casper.com that return and warranty may differ from what is presented on the Casper website. Additionally, Casper has opened a number of pop-up and permanent shops throughout the United States and Canada that allow for customers to try out and pick up mattress and other sleep products. For a list of all locations check here. Additionally over 1,000 Target stores nationwide offer at least some Casper bedding products. To locate a Target near you and view what Casper products they have available check out Casper’s online “locate a store” tool.